After pulling the trigger on purchasing light fixtures, I got the urge to put curtains up in our family room before the holiday season is in full-swing. We host a big cocktail party every year and we are hosting my family for Christmas this year. Curtains just add the warmth I want for my family’s first Christmas in our new home. 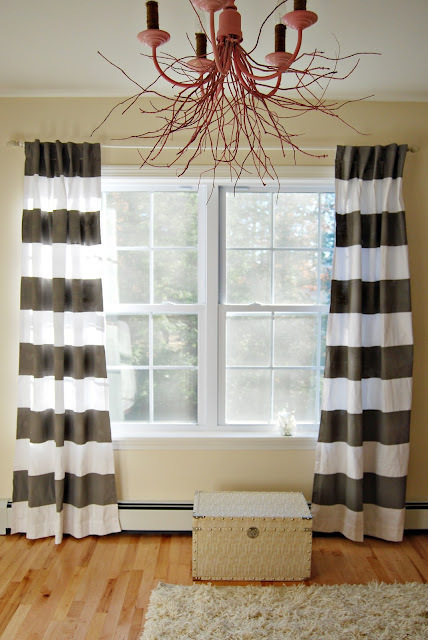 Thanks to my readers (and a few ideas of my own), I have decided to throw together a quick list of inexpensive ways to get the curtains you love. There are so many ways to find window treatments for your home, but many are really expensive! When searching for family room drapes for our new home, I found that one panel could range from $40 to hundreds of dollars at the length we needed. We needed 10 panels, so this just didn’t work for us. Instead, we bought fabric we loved and had a family friend sew simple curtain panels for us. We are SO happy with them. Here are a few other ways to get the window treatments you want without spending a fortune. 1. Hang sheets or duvet covers using drapery ring clips. 2. Paint plain white curtain panels—try stripes like the ones on Reckless Glamour or the stenciled ones on The Sweetest Digs. 3. 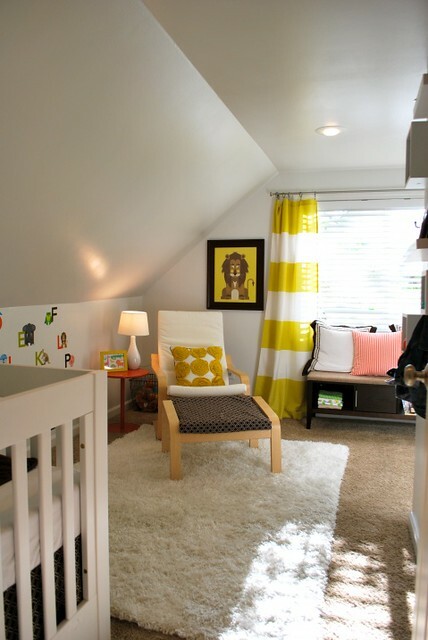 Buy fabric and make no-sew panels like the ones on Young House Love. 4. Buy fabric and have a talented friend sew very basic panels like ours. 5. Use a shower curtain like these at Honey and Fitz. 6. Dye basic white panels like we tried to do. I’ll be honest-I didn’t’ want to recommend this one, but I know it works so well for many people. It just didn’t fly for us. :( I may try again another day though. Thank you to all of my readers who submitted some of these ideas via comments or through email. If you know of great ways to get chic rugs (or great shops that offer low price options) on a budget, let me know. Email livethefancylife@gmail.com or leave a comment on this post. Thanks! One Response to "6 inexpensive ways to get curtains you LOVE"
Love the shower curtains.Looking so gorgeous.